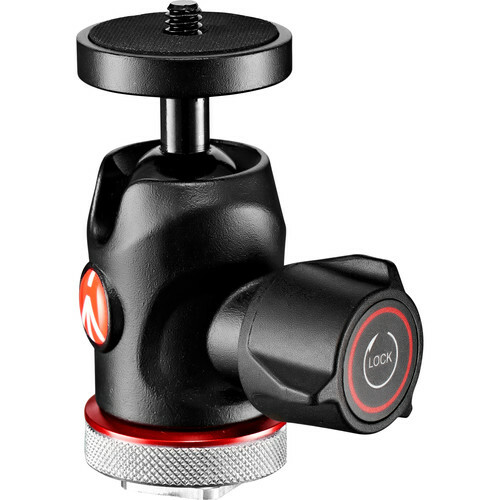 The 492LCD Micro Ball Head with Cold Shoe from Manfrotto can support up to 8.8 pounds, and the head has a single lever lock, which controls the ball and pan movements at the same time. The 0.42 lb head has a cut notch on the side that allows you to position the camera at a 90° angle. Attach the camera to the head via its 1/4"-20 mounting thread. Photographers and videographers alike will find this tool useful for holding different accessories on their bracket or video rig, and it will slide into any available shoe. Therefore, a microphone, video light, or flash can be held securely in place, to help you capture better audio, video, or stills. Box Dimensions (LxWxH) 4.4 x 3.5 x 2.6"